In Podcast 30, we meet Ajit Yoganathan, PhD, Regents’ Professor, Associate Chair for Research, and the Wallace H. Coulter Distinguished Faculty Chair in Biomedical Engineering at Georgia Institute of Technology. Dr. Yoganathan and his colleagues are focusing on the development artificial heart valves and the use of novel instrumentation such as Doppler ultrasound and magnetic resonance imaging to non-invasively study blood flow patterns in the heart. 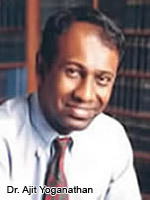 Dr. Yoganathan established and leads the Cardiovascular Fluid Mechanics Laboratory at Georgia Institute of Technology. The objective of this laboratory is to integrate biological knowledge with engineering principles to understand the function and mechanics of various cardiovascular diseases and help the cardiac surgeons in planning, developing and implementing novel surgical repair techniques using state-of-the-art technology available today. The key thrust areas of the laboratory are in understanding the function and mechanics of native and prosthetic heart valves and in correcting pediatric and adult congenital heart defects.